There are millions children out there who needs our helping hands so they can attend to school. 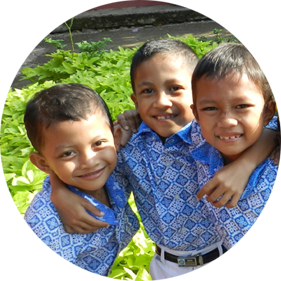 For 20 years GNOTA keep working out to ensure that Indonesian children could complete their 9 year basic education so they should not dropping out their education. We encourage you to join and participate in our cause, sharing the happiness and helping the less fortunate children so they can still attend to their school by providing their educational needs. GNOTA donation is reserved for building public movement to concern for the sake of Indonesian foster child educational needs. Contact our website www.gn-ota.or.id for further information or contact our hotline channel at +62 21 3900 900 (Mr. Rudi). Donate your zakat (alms) in accordance to your beliefs with GNOTA Alms of Hope. We will accumulate all alms donation to help our foster children.